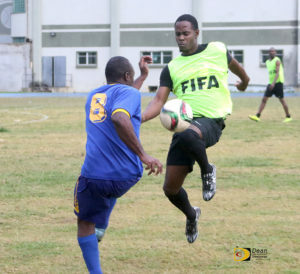 When the Panthers and One Love showed up on Sunday to play their scheduled BVI Football Association league match at the A. O. Shirley Grounds, players and the few fans who braced the rain, were shocked to learn that there we no linesmen to raise their flags and assist the referee in calling balls that go out of bounds. Players and fans quickly learned there are only a few linemen on Tortola as well. The only qualified persons to call lines were on Virgin Gorda. To top it off, the ferry wasn’t running from Virgin Gorda to Tortola because of the weather conditions, therefore, the game had to be called off. Both teams used the time for a high level scrimmage. It was the first time in the 44-year history of the BVIFA, that a game has been called off because of a lack of linesmen. Why aren’t there linesmen on Tortola where the association is based so at least one game could have been at least played on Sunday? Liburd when asked, said they are seeking to get 25 linesmen in their pool, in accordance with their governing body FIFA requirements and that they be qualified. With no boats running, Tortola based teams F.C. Sea Ago, Old Madrid and the Wolues, couldn’t travel to Virgin Gorda either, thus cancelling all weekend matches.